A long time ago, that is to say in 2006, I had to translate the description of a tsuba by the great master Kanô Natsuo (加納夏雄, 1828-1898). It crossed my mind recently when I had to find out something about the construction of Japanese fans. As I was fond of the story behind the motif, I would like to introduce it here. The motif is called „suehirogari“ (末広がり) what means literally „something that opens “, but it is also the title of a short and humorous waki-kyôgen play of an unknown author. The first stage adaption was called „Wakamidori Suehirogari“ (稚美鳥末広) and had its première in Ansei one (安政, 1854) at the kabuki theatre Nakamuraza (中村座) in Edo. The composer was Kineya Rokuzaemon (杵屋六左衛門), the lyricist Sakurada Jisuke (桜田治助) and the choreographer Tôma Kanjûrô (藤間勘十郎). The play is about an errand who was wrong but manages it to bring it to a happy ending. A certain lord called „Kahômono“ (果報者) is in the middle of preparations for a banquet and needs some presents for his guests. The present for his elder should be a folding fan, a suehiro, whose name goes back to the aforementioned literal meaning „something that opens“. Thus a folding fan is a symbol for the growing and prosperity of a family. So he calls for his errand Tarôkaja (太郎冠者) and tells him to go downtown and buy „a suehiro with a paper of decent quality and a playful painting“. Well, Tarôkaja sets out for the shopping streets but is actually not aware what a suehiro is. Downtown he asks through but comes to the wrong person, a slicker called „Suppa“ (すっぱ) who tells him that the old umbrella he sells is a suehiro. Well, the thing with the „opening“ makes sense for Tarôkaja and the „friendly hawker“ teaches him a song to sing with such an umbrella. And at the persuasion scene of Suppa, a pun on what Kahômono said is made. Kahômono told him „with a playful painting“, in Japanese „zare´e“ (戯れ絵), but when Tarôjaka asks Suppa if the suehiro has a zare´e, the slicker replies „yes, it has“, but refers to a „playful handle“, also pronounced as „zare´e“ (戯れ柄). Back in the residence of his lord, Tarôkaja proudly hands over the umbrella as he was sure that he got the right thing but Kahômono gets very angry and tells him off. And now Tarôkaja´s talent comes into play. He starts namely to sing the song Suppa taught him before which goes: „Kasa o sasunaru Kasugayama, kore mo kami no chikai tote, hito ga kasa o sasunara, waga mo kasa o sasô yo, geni mo saari, yayo gari mo sô yo no!“ (傘をさすなる春日山、これもかみのちかいとて、人が傘をさすなら、我も傘をさそうよ、げにもさあり、やよがりもそうよの！) „The divine Mt. Kasuga opens like an umbrella, the people open their umbrella all the time, but when I open an umbrella, I get scolded!“ And here we have another pun. Tarôjaka is now aware of the difference between a suehiro folding fan and an umbrella, a kasa (傘), and ostentatiously emphasizes the latter word in this song. By the way, it was said that the Kasuga mountain range in Nara has the shape of an umbrella, that´s why it occurs in that song. Kahômono cheers up and joines his errand singing and dancing. So the moral of this short and humorous play is that it is the thought that counts. Often namely such waki-kyôgen have a lord or master who has to organize stuff and everything ends in a mess. Sometimes the arrogance of the lord is the reason for the mess and sometimes also the incompetence of his servants but there is always a happy end. Picture 1: „Suehirogari“ ukiyo´e print by Tsukioka Kôgyo (月岡耕漁, 1869-1927) from his series „Nôgaku-zue“ (能楽図絵, „Pictures of Nô Plays“), 1898. 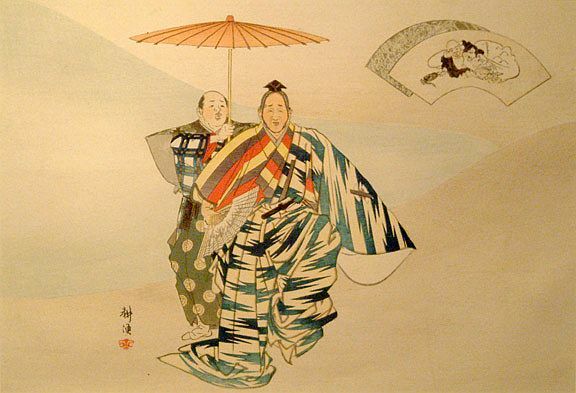 We see Tarôkaja with the umbrella, his lord Kahômono already dancing and at the top right symbolically two suehiro folding fans. The tsuba is of iron, in aori-gata, has an uchikaeshi-mimi and a takabori-zôgan-iroe ornamentation. It was ordered by the Katô family (加藤) and finished and delivered in the first month of Man´en one (万延, 1860). So it is noted by Natsuo´s third son Akio (秋雄, ?-1950) in the hakogaki. It is assumed that the piece was commissioned one year before, i.e. in Ansei six (安政, 1859), the year in which Natsuo married, as many orders by the Katô were placed to support the artist. 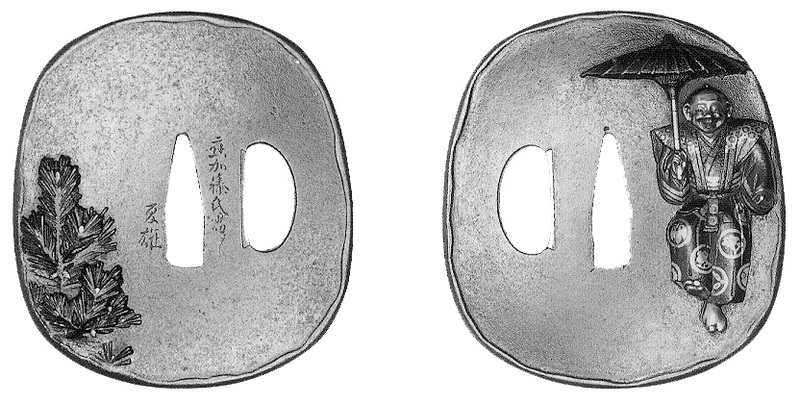 Often Natsuo had free choice of the motif and interpretation of the tsuba he made for his patron. The entire right side of the omote is occpuied by the joyfully dancing Tarôkaja wearing a loud stage outfit. The ura side is calm and shows a young pine, a New Year´s decoration as the banquet in question was a New Year´s banquet. Fascinating for me is the interplay of so many facets just on such a small but fine tsuba. We learn about the life circumstances of the artist by the mention of the name of the client, we have the hakogaki by the master´s son which confirms the date the piece was completed, than we have a peephole through which we can see the late 19th century world of waki-kyôgen, and we learn something about the then humour and the plenty use of puns. That means tsuba can be so much more than simple hand guards. Thanks for sharing Justin! Beautiful set. Always fascinating to see how much subjective three-dimensionality the kinko artist were able to reproduce in menuki.